Super Mario Maker is a side-scrolling platform video game and game creation system developed and published by Nintendo for the Wii U game console, which released worldwide in September 2015. Players are able to create and play their own custom courses, based on Super Mario Bros., Super Mario Bros. 3, Super Mario World and New Super Mario Bros. U, and share them online. Over time, new editing tools are unlocked, allowing players to download and play courses designed by other players. 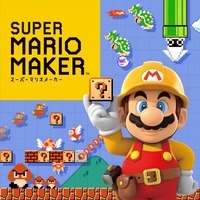 Super Mario Maker received critical acclaim upon its release, with reviewers praising the game's user interface and course editing tools. By May 2016, over seven million courses had been created by players worldwide, which had been played over 600 million times. An adapted port for the Nintendo 3DS, known as Super Mario Maker for Nintendo 3DS, was released in December 2016.